You’ve found the right person for the job. Now what? The process of creating a great staff doesn’t end with “You’re hired.” When a new employee joins your organization, it’s important to give them the training they need to live up to their full potential. 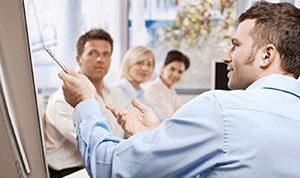 When employee orientation includes our DISC training solutions, your staff has all the tools they need to understand their place within the organization, work well with existing employees, communicate better with customers, improve their motivation, and increase productivity. We can help you develop and harness your employees’ talents, and make sure that they hit the ground running. Training isn’t just for the new guy, either. Existing employees also benefit greatly from ongoing training opportunities. Whether the person has been with you for ten days or ten years, DISC training can help employees refresh, refine, and refocus, giving them the direction they need to grow and thrive. PeopleKeys training products have been shown to improve morale, create employees that require less supervision, increase company loyalty, improve overall performance, and reduce turnover. We offer a wide range of DISC training solutions, appropriate for employees in every industry, at every level. See a full list of our online behavioral courses and DISC certification programs. For customized training solutions, such as orientation videos specific to your company or your own Learning Management System for onboarding & employee orientation, please contact PeopleKeys. If you want more of a hands-on training approach, consider hiring a PeopleKeys consultant to conduct a live training with your staff.